Door Hangers - PrintFirm.com provides custom door hangers. It's FAST and EASY. Order today and SAVE! 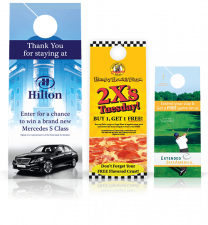 Door Hangers are quite effective marketing tools that can be placed in a large variety of locations. From hotel doors to residential neighborhoods, there are many locations to choose. Be certain you have permission from the business owner in the case of business door hanging, and from the local zoning board for residential placement. Even if the local zoning board has no problem with it, be aware that some residential homeowners have their own restrictions. 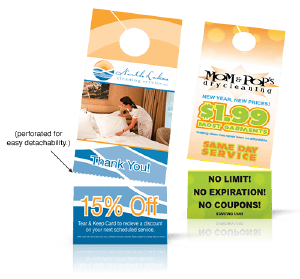 PrintFirm can give you consistent, quality results for door hanger printing. We offer standard door hangars and door hangars with a card that can be detached, also known as a rip card. Our standard door hangars are available in measurements of 3.5" X 8.5" and 4.25" X 11". Paper choices include a durable 14-point card stock with UV coating that repels dirt and moisture, or a non-UV coating that has a matte appearance. Thinner 100 lb. gloss text paper is another option. Door hanger printing can be on the front only, or front and back. The hole punch for the doorknob is included at no extra charge. Our door hangars with rip card have the same options as our standard door hangars, but 100 lb. gloss text is not available. You can upload a design to our website for door hanger printing. We accept many popular graphic design file types such as PDF, AI, JPEG, TIFF, etc. We have pre-made design templates for our standard door hangars, though they are not an option for the door hangars with attached rip cards. Pre-made templates include background artwork that will save you time during the design process, though these templates are not available for the rip card hangars. If nobody in your organization is skilled at graphic design, you can select our custom design service when you place the order. PrintFirm"s talented team of graphic artists will create a unique design. You can still upload any graphics or text that you want to use and our designers will incorporate them into the layout. For quality door hanger printing, we ask that you use only high-resolution images in the design. All graphics should have a resolution of at least 300 DPI (dots per inch). Lower resolutions could masquerade as high quality on your computer screen, but the printed result is typically a fuzzy mess. Images found on the internet are generally low resolution, so please use caution when adapting them. To check the DPI of an image, open the file in a reputable graphic design program and display the file details. We recommend that you avoid cluttering the door hanger design with too much text or graphics. Your main font should be large in order to grab the attention of the viewer, and that large font won't be readable enough if you clutter the design. Be careful with any design near the hole punch because that area is not as visible. Please consider PrintFirm for all your door hanger printing needs. We believe that quality is just as important as giving discounts for quantity.